Sylvia Taylor, President of the Federation of BC Writers, has had a life full of interesting adventures and accomplishments. She is the author of a book about her time on in fishing boat on the Pacific Coast called The Fisher Queen, but tough as she is, she can still be distracted. And apparently, all through her moderating of the Forum on the State of Canadian Publishing at the Shuswap Lake International Writers’ Festival she was being sorely distracted by an adorable pair of shoes worn by a writer in the front row. 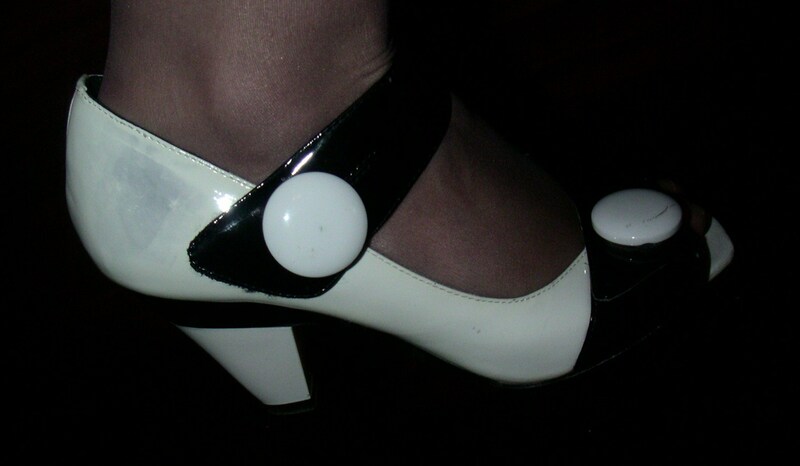 They were Cute Shoes: very graphic black and white patent leather peep-toes with big buttons, bobbing on the end of animated feet. They’re the kind of shoes that are busy gossiping things like, “Come be my friend!” or “I’d love to talk to you!” or even, “I love your Fisher Queen book, Sylvia!” even while the hands above the feet are busily typing notes about t he discussion, and the head is busy processing the information and asking intelligent questions. Those shoes were not the smart girl with her hand in the air, they were the cheer leader in the back driving the teacher – or moderator – crazy with her giggles. You did a great job moderating.